Manchester United were a dominant force in English football in the decades after World War Two. They were League champions five times, FA Cup winners twice, and runners-up in both competitions on numerous occasions. Managed by the legendary Matt Busby, United were the first English club to participate in the European Cup and the first to win the coveted trophy, in 1968. Busby joined United then Manchesters smaller club from City before the War. Afterwards, United had to play at Maine Road, as Old Trafford had been badly damaged by German bombs. With no money to buy players, Busby single-handedly created what would become one of the worlds most famous clubs. Busby built three great teams in his 20-odd years at the helm. Each was different, each had style, and each won trophies. 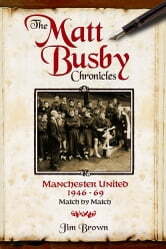 After the destruction of his second great team at Munich in 1958 Busby built a third, with which he achieved his dream of winning the European Cup. Follow the rise of Britains best-known football club, from the dark days of appealing for clothing ration vouchers to buy kit, to the memorable nights of European glory. Assisted by unparalleled statistical data, this book not only tracks Busbys championship (plus the Munich and European Cup-winning) seasons match-by-match, but also offers a rare insight into the austerity of post-War football.